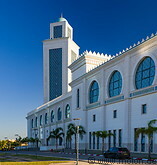 The Grand Mosque Abdelhamid Ibn Badis is located near an intersection, a few km east of the centre of Oran. It was inaugurated in 2015. The mosque has a minaret which is 104m tall and can accommodate 25000 people. 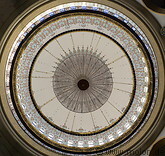 It is built with stone in white-light beige colour. Next to the mosque there is a large parking for cars.